It has been estimated that 25% or more of a family’s energy expense come just from the cost of running the water heater. If you’d like to cut down on your energy costs, consider a high-efficiency water heater. It may cost a bit more initially, but you’ll save a lot of money in the long run. Water heater repairs and installations are not easy tasks and mistakes are one of the most common causes of injuries and water heater failures. Don’t risk your family’s safety or well-being. Request an Estimate from the water heater experts at Oliver today or call 1-877-757-1141. Below are some basic details about the different types of water heaters available to homeowners. You can also visit the specific pages for each type to learn more about the services we offer. Tank-type water heaters store hot water so that it’s always available when needed. By far the most common type of water heater, tank-type water heaters can rely on electricity, natural gas, propane or fuel oil as a heat source. 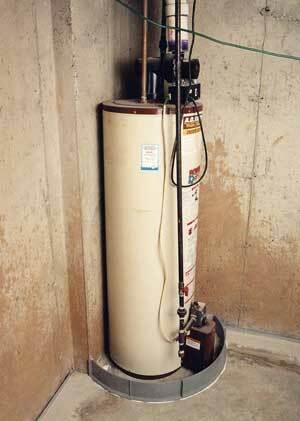 A thermostat in the storage tank controls water heating to maintain a constant water temperature in the 120-degree to 140-degree range. Insulation surrounding the tank reduces standby heat loss. Typical tank size for households is 50-80 gallons. Typical maintenance: Drain sediment from bottom of tank, replace sacrificial anode. Expected service life: 10-15 years. Heat pump water heaters qualify as tank-type water heaters and are powered by electricity. A small, air-source heat pump installed on top of the hot water storage tank pumps hot, pressurized refrigerant compound into a heat exchanger located in or around the hot water tank. A heat pump water heater is more expensive than a standard tank-type water heater, but it’s also about twice as energy efficient. Typical maintenance: Drain sediment from bottom of tank, replace sacrificial anode, clean air filter on heat pump. What can go wrong: Faulty pressure-relief valve, corrosion, sediment buildup, leaks in tank or fittings, less efficient operation in a cold environment. 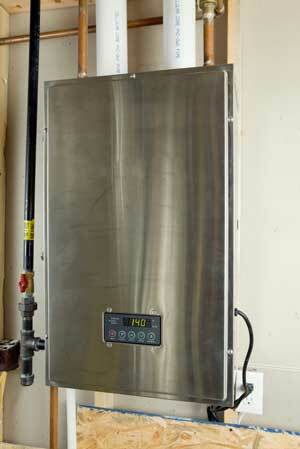 Tankless water heaters are compact & efficient. This type of water heater is also known as a “demand” heater because the heating element only comes on when a demand is made for hot water. Most tankless water heaters use propane or natural gas as a heat source. They can cut water heating expenses significantly in households where hot water use is infrequent. Typical maintenance: Service heat exchanger to remove scale, clean in-line water filter. Expected service life: 15-20 years. What can go wrong: A single tankless heater may not have sufficient capacity to supply hot water to multiple locations at the same time. Indirect water heaters use heat from a boiler. When a house has some sort of hydronic (water-based) heating system, the boiler that heats water for whole-house heating can sometimes also supply hot water for washing. Typical maintenance: Drain sediment from bottom of tank. Expected service life: 20 + years. What can go wrong: Corrosion, sediment buildup, leaks in tank or fittings. Don’t wait until you have a leak: Contact us today! Call 1-855-627-3490 or get an online quote to schedule an appointment with Oliver. We provide free estimates for water heater repair and installation, as well as complete plumbing services.